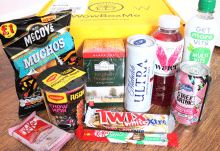 They have two levels of subscription: the Tasting, which is smaller, and the one I have received, The Classic.Subscriptions are prepaid for one, three, six, or twelve months. 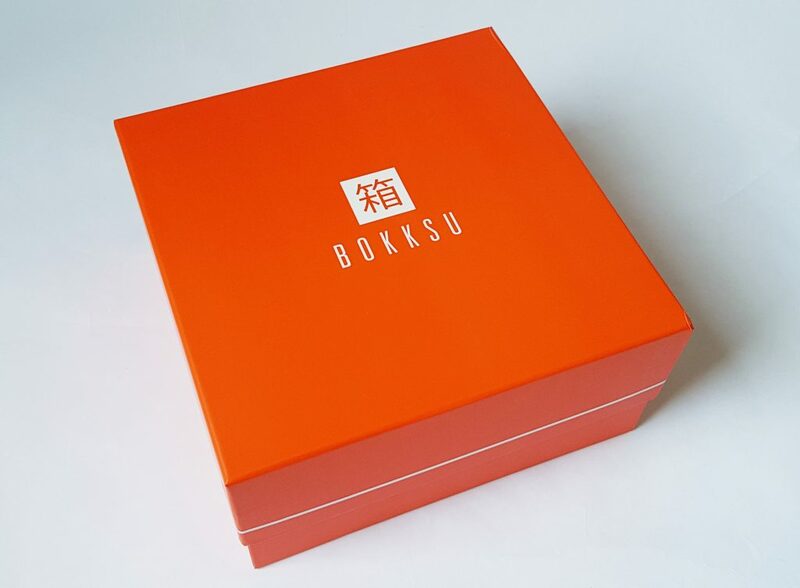 The box arrives inside a regular cardboard box, so it looks nice and tidy. This month’s theme isn’t geographical, rather it’s celebrating Halloween! 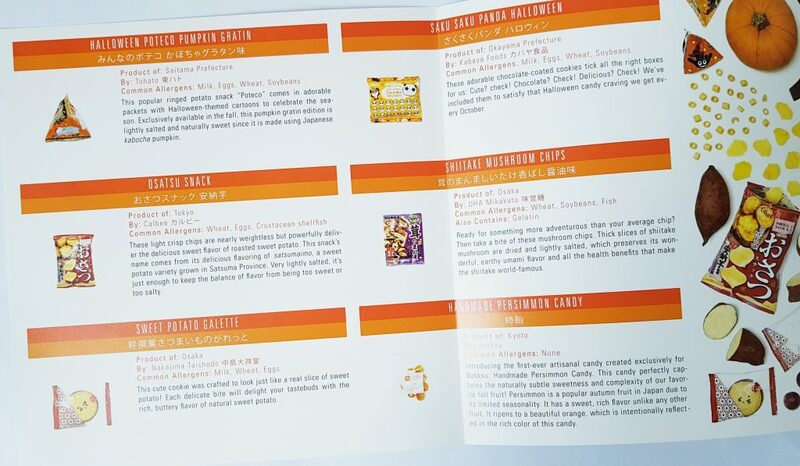 The menu leaflet has lots inside, it’s a double fold so needs two pictures to show you the whole thing. You’ve got pictures and details about each item, as well as an allergy guide. 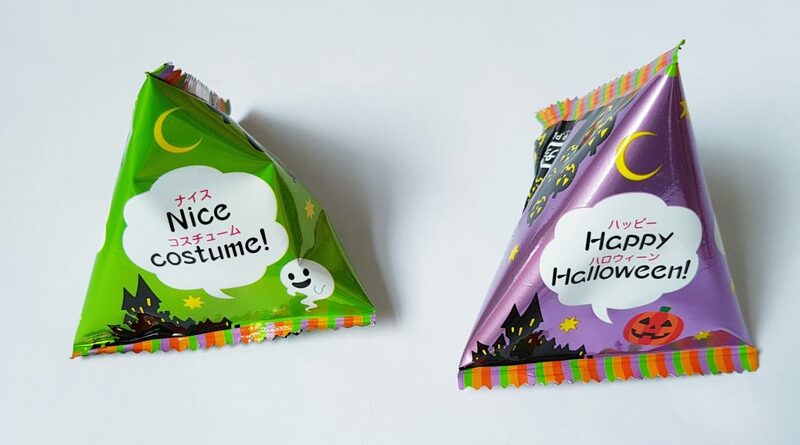 These little Halloween-themed triangles are Poteco Pumpkin Gratin. 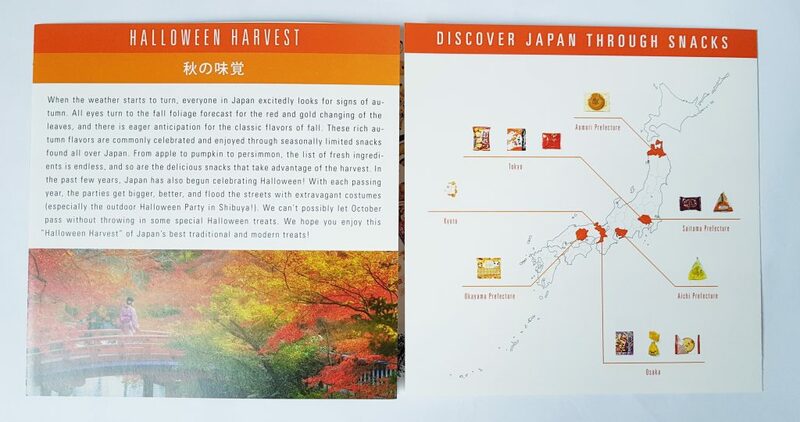 Potco are little potato rings, and this version of theme is salted and made with Japanese kabocha pumpkin. 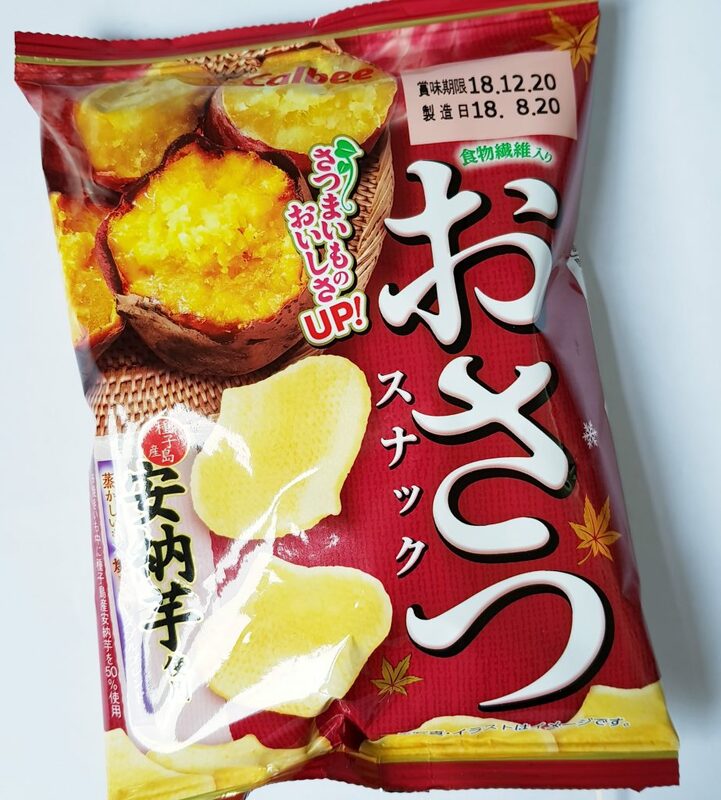 Osatsu Snack are very light and crispy sweet potato chips. They’re only available during the colder months. These Sweet Potato Galette are buttery sweet potato cookies that are designed to look like actual sweet potato slices. 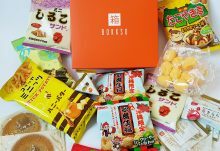 Another Halloween-themed snack, Saku Saku Panda Halloween are chocolate covered cookies in the shape of different panda faces. Shiitake Mushroom Chips rather remind me of the dried mushrooms you soak and use in cooking. 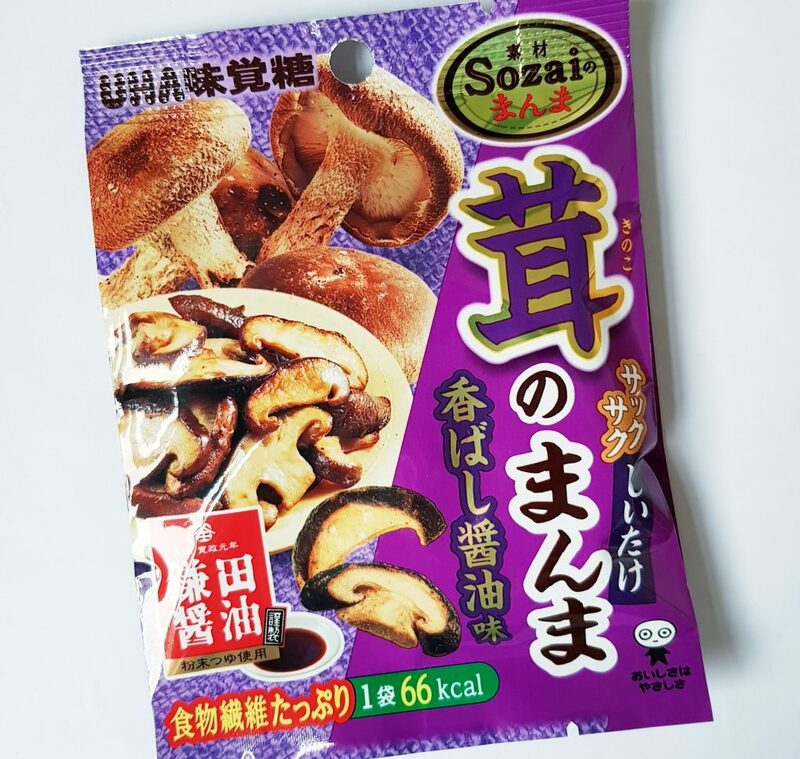 These are crunchy and salted, and have the typical deep umami flavour of shiitake mushrooms. 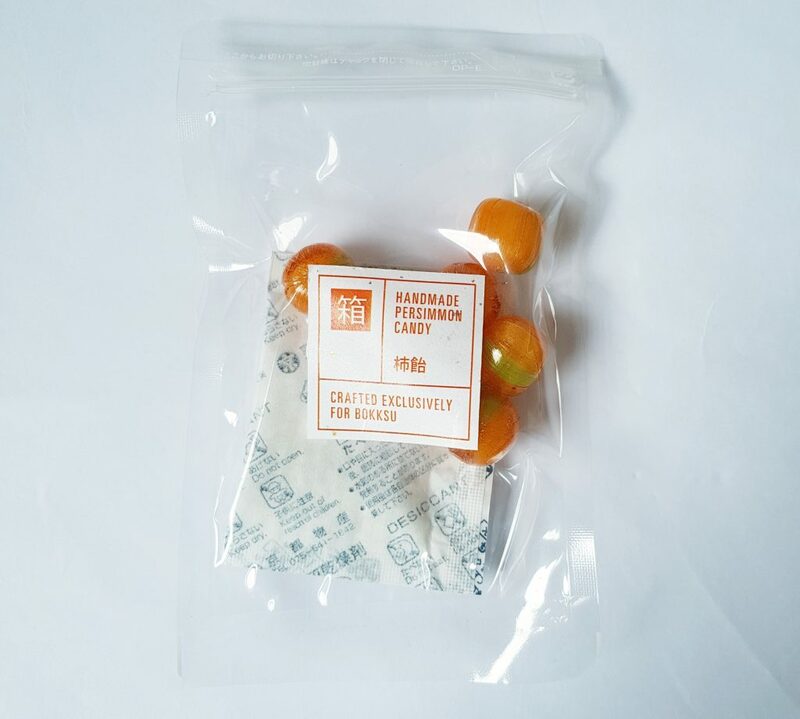 This Handmade Persimmon Candy has been made especially for Bokksu. Persimmon is a popular fruit in Japan in the autumn, especially as it is only in season for a short time. The colour is also very appropriate. These are Apple Butter Financier, the Japanese answer to a popular French cake. 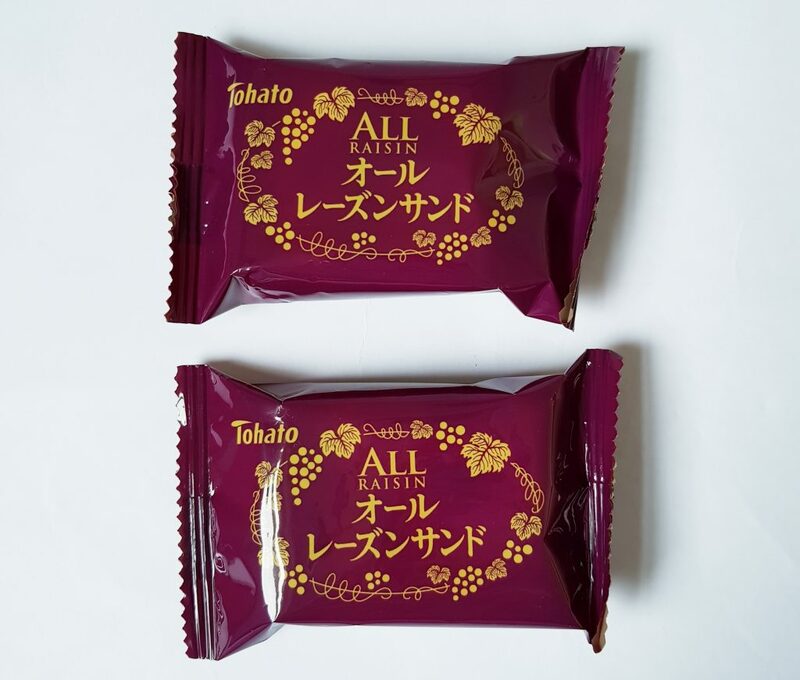 These little cakes are made with almond flour and contain apple butter made from apples grown in Japan. These are very unusual. 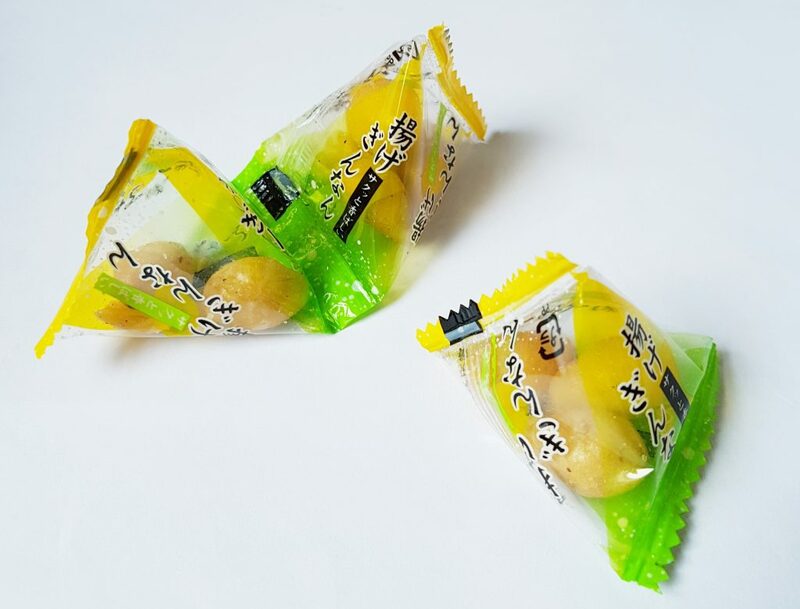 Fried Ginkgo Nuts are another seasonal treat in Japan. I really love these Gudetama Custard Chocolate Halloween because Gudetama is my favourite kawaii character! 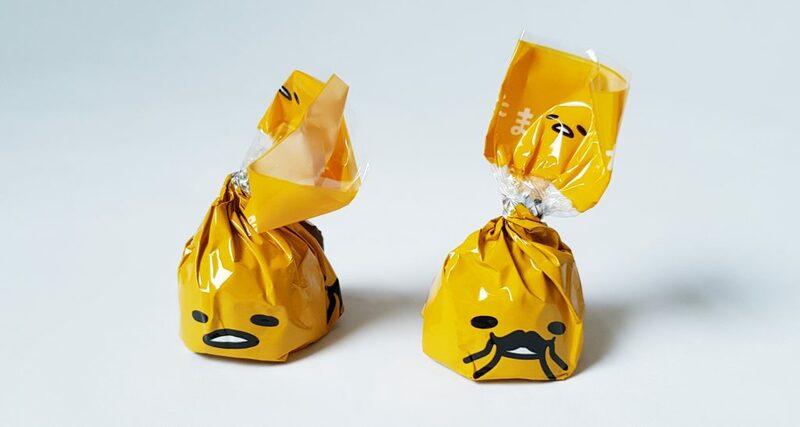 These are little chocolate balls filled with custard cream, with funny versions of Gudetama’s face on the packaging. Very cute! 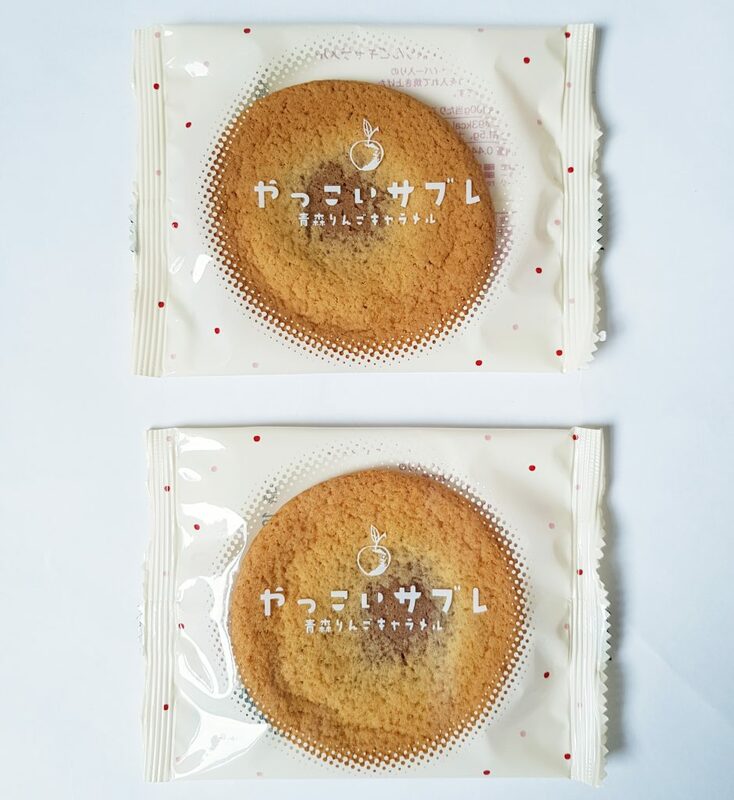 These large soft cookies are called Apple Caramel Yakkoi Sable. 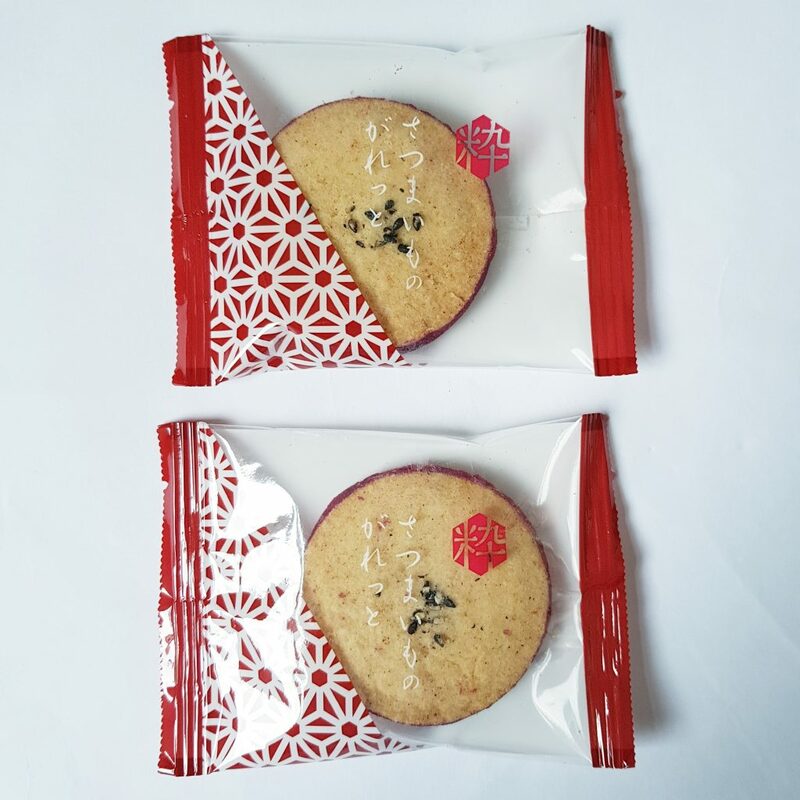 As is common in Japan, it’s based on a French bakery item, a butter cookie. This version is soft and chewy and very delicious. Chocolate Raisin Sandwich Cookies. Plain raisin biscuits with a creamy white chocolate filling. 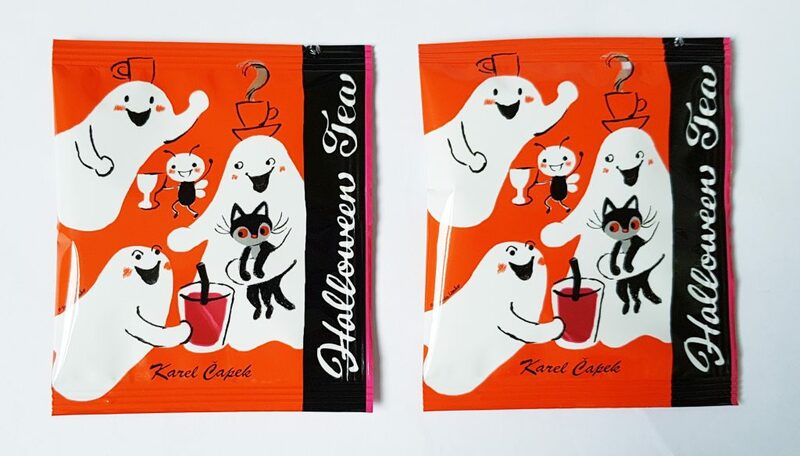 Finally, this month’s tea is Halloween tea from the teamaker Karel Capek. It’s a black tea flavoured with grapes which is unusual but interesting. 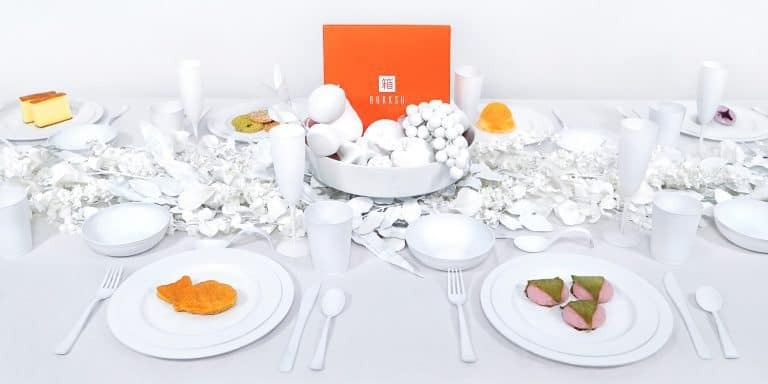 It also has really fun packaging! It’s great to see another non-geographical theme! 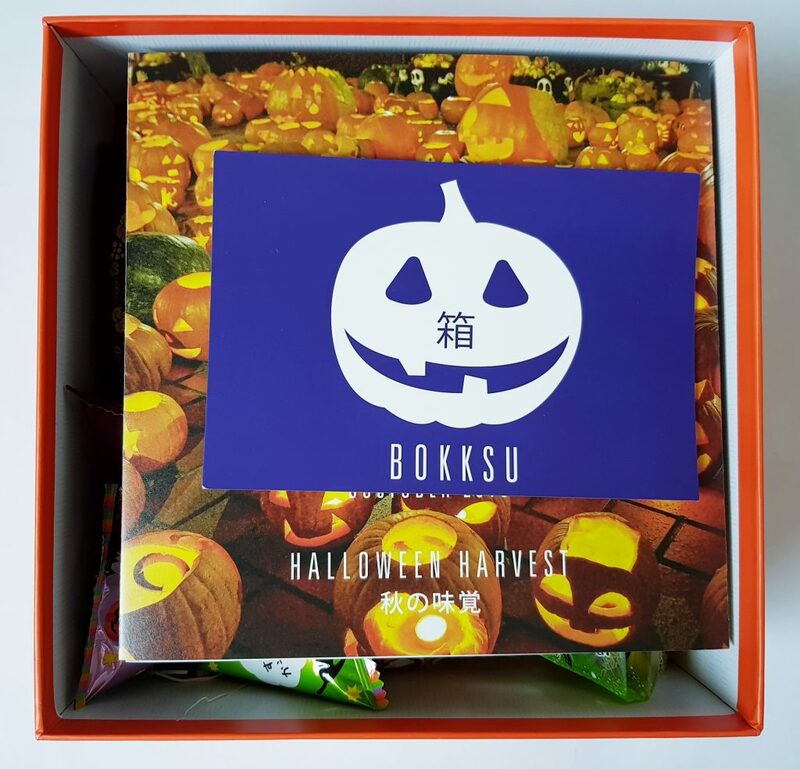 Halloween is such fun, and has such great opportunity for both decorations and flavours, and I think Bokksu has made some great selections. The one think I’m slightly puzzled by is a couple of the allergy warnings on the menu. I always am very careful of these (and very grateful!) because I’m allergic to shellfish, and it’s quite common for Japanese snacks to contain shrimp, squid, or similar. But shellfish was listed on some of the items where it doesn’t seem quite right. As far as I’ve seen elsewhere, these chips don’t contain shellfish, as they’re sweet-potato based with no indication of other flavours, but I’m not going to risk it. I’m sad not to try the ginkgo nuts because I’ve very curious about them, but again shellfish is on the menu, even this seems unlikely. As for the raisin chocolate cookies, I’ve had these before and they definitely do not contain shellfish of any kind! I think there’s some kind of misunderstanding going on here. It may be that they are now labelling things which are made in the same factory as shellfish things, but while it’s worth nothing, it’s extremely different from the actual ingredients! As I said, I really appreciate the allergy labelling, but I think they need to add a little clarity. The same goes for other allergens, as I’m not totally convinced that simple fried nuts contain all the things listed in the allergen guide. Anyway, apart from that side note, I love this month’s selection. 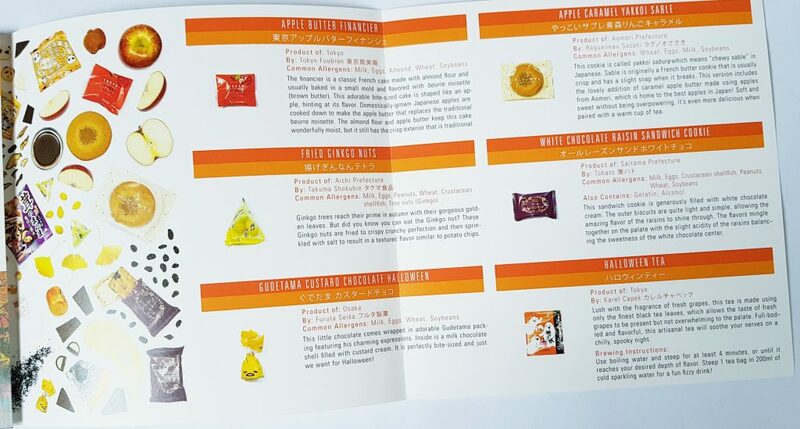 I think my favourites are the apple snacks, especially the Yakkoi Sable cookies which are just amazing, I wish there were more than two! The apple butter financier is also delicious. Oh, and of course the Gudetama chocolates! Cutest chocolate ever. 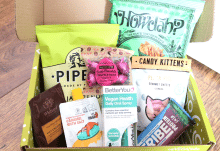 This box isn’t the cheapest, but it really is a selection of fun and cute plus some gourmet items. There’s no chance you’ll be picking these up anywhere else, and it’s a great opportunity for foodies and unusual flavour enthusiasts to try new flavours. 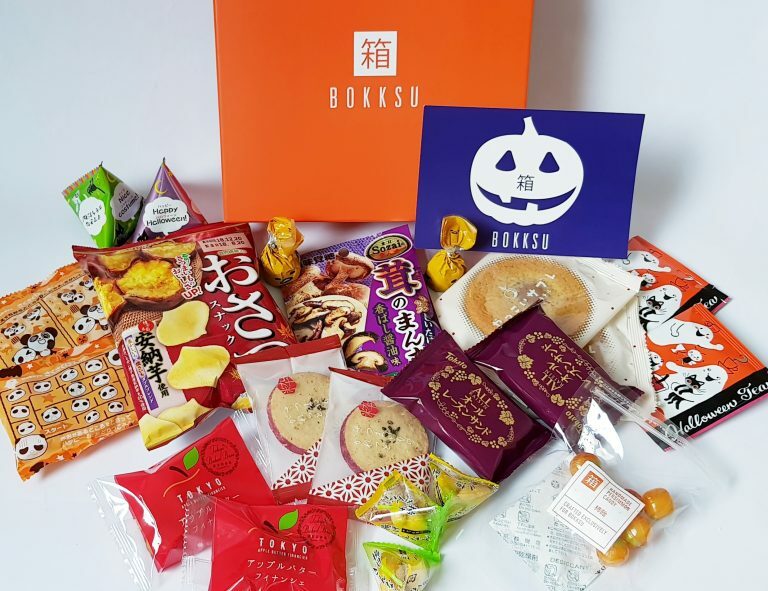 A lovely seasonal selection with some new and interesting flavours, plus fun festive themed Halloween goodies!